Lex: What killed me is you didn't even want it. You fought it, you hid from it. I would have taken it and relished it and embraced it. Clark: My destiny wasn't yours to take! Lex: I get that now which is why I've finally embraced my own. You and I, we will both be great men because of each other. We have a destiny together Clark, only on different sides. 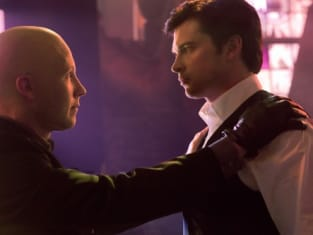 Smallville Season 10 Episode 22: "Finale Part 2"
But if you look at history the great men and women of the world have always been defined by their enemies. Lex: You still say it the way way. Astonishment, mixed with a hint of dread, yet with a hopeful finish.